Parish Cup holders Booth will be going to Sowerby Bridge’s Walton Street ground after all next season. Last season’s double winners were paired with Bridge in last night’s draw for the first round of the cup, which was made at the league meeting at Pellon Club. Bridge had to play home matches at Stainland last season, after the ravages of the Boxing Day floods in 2015, and the firsts were relegated from the Premier on the final day in a desperate scramble for survival. The general consensus was that they were unlucky to go down and Booth skipper Richard Laycock is expecting a stern test on Sunday, May 7. He added that Bridge had some useful players, including Sam Mellor and Tim Helliwell. Laycock expects to have the same group of players under his command. “Our team will probably be very similar with possibly one signing,” he added. The plum tie involves Jer Lane and Warley, two of the league’s big guns, while the Sowerby St Peter’s versus SBCI match is another mouth-watering contest. Illingworth SM, returning to the Halifax League from the Aire/Wharfe League, face an interesting trip to Blackley. Meanwhile, Birkby Rose Hill have been readmitted to the Sunday League on a vote of 8-1. League chiefs said they would investigate claims by a couple of clubs that they had not been given the chance to take part in the electronic vote. Triangle say they are unable to host this year’s Crossley Shield second teams’ final on Sunday, August 20 and the league has invited applications from other clubs to stage the game. The deadline for applications is the end of February. All but six Halifax League clubs have attended workshops to discuss a cricket development strategy for junior and senior cricket. A follow up session to discuss the many ideas is to be held on Tuesday, March 7 at a venue to be confirmed. There is a level one coaching course at Brooksbank School on March 1, costing £48, and a first aid course at Blackley on April 11, costing £20. More details from Julie Pearson on 07704 668869. DRAWS - Parish Cup, first round (May 7): Sowerby Bridge v Booth, Thornton v Bradshaw, Sowerby SP v SBCI, Leymoor v Birchencliffe, Queensbury v Copley, Clayton v Bridgeholme, Outlane v Stones, Northowram HT v Cullingworth, Southowram v Oxenhope, Jer Lane v Warley, Great Horton v Low Moor, Old Town v Luddenden Foot, Upper Hopton v Triangle, Shelf v Mount, Greetland v Mytholmroyd, Blackley v Illingworth SM. Crossley Shield (May 7): Triangle v Leymoor, Luddenden Foot v Sowerby Bridge, Bridgeholme v Thornton, Copley v Great Horton, Birchencliffe v Outlane, Oxenhope v Shelf, SBCI v Northowram HT, Low Moor v Queensbury, Cullingworth v Upper Hopton, Bradshaw v Jer Lane, Mount v Old Town, Stones v Sowerby SP, Mytholmroyd v Blackley, Warley v Southowram, Illingworth SM v Bradley and Colnebridge, Booth v Clayton. 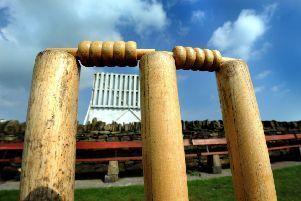 Foster’s Twenty/20 competition (Tuesday, May 2): Birchencliffe v Blackley, Shelf v Queensbury, Southowram v Mytholmroyd, Jer Lane v Triangle, Copley v Northowram HT, Low Moor v Upper Hopton, Cullingworth v Stones, Thornton v Sowerby SP, Sowerby Bridge v Bridgeholme, Illingworth SM v SBCI, Stainland v Greetland. Byes: Leymoor, Luddenden Foot, Great Horton, Old Town, Booth. Sunday League, Rod Warhurst Cup, Group A: Sowerby bridge, Bridgeholme, Almondbury Wesleyans, Sowerby SP. Group B: Mytholmroyd, Northowram Fields, SBCI, Blackley. Group C: Barkisland, Thornton, Lightcliffe, Norden. Group D: Illingwoirth SM, Rastrick, Copley, Southowram.